Calvin F. Quate was born on 7 December 1923 in Baker, Nevada. He received the B.S. degree in Electrical Engineering from the University of Utah in 1944, and the Ph.D. degree from Stanford University in 1950. In 1949, he joined the technical staff at Bell Telephone Laboratories, Murray Hill, New Jersey, and soon became Department Head and then Associate Director of Electronics Research. He transferred to Sandia Corporation in Albuquerque, New Mexico in 1959. In 1960, he was appointed Vice-President and Director of Research. 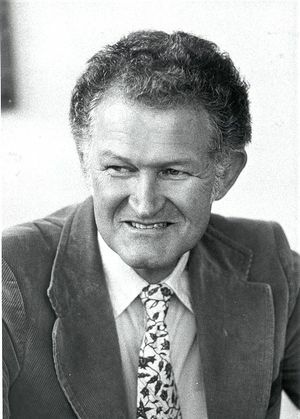 Quate joined Stanford University in 1961 as Professor of Applied Physics and Electrical Engineering. He has served as Chairman of the Applied Physics Department, as Acting Chairman of the Electrical Engineering Department, and as Associate Dean in the School of Humanities and Science. Presently he holds the Leland T. Edwards Chair in Engineering at Stanford, and since 1984 has been a Senior Research Fellow at Xerox Palo Alto Research Center (PARC). Quate has worked on acoustic amplifiers, interaction of acoustics with semiconductors, and acoustic correlators, all of which have become important fields of research. His early work led to an understanding of noise space charge waves on electron beams, practical systems of periodic focusing of electron beams, coupled helixes in traveling wave tubes, and the design of practical microwave amplifiers and oscillators. He initiated the activity on acoustics that led to the scanning acoustic microscope, which has resolution exceeding that of optical microscopes. It sharply reveals structure in optically opaque or even transparent materials. One can "see" things with sharp contrast that are not easily seen with optics and can examine sub-surface structures in integrated circuits that is not at all visible with optics. Quate's judgment and enthusiasm is infectious and has led many of his colleagues to work in acoustics and related fields. His work on electron tunneling microscopy revealed the atomic scale structure of crystalline substances. Quate has served on several government committees, including the Defense Science Board. He is a Fellow of the IEEE and member of both the National Academy of Engineering and the National Academy of Sciences. In 1981, he received the Morris N. Liebmann Award of the IEEE, and later the Ultrasonics, Ferroelectrics and Frequency Control Society's 1986 Achievement Award. In 1982, he received the Rank Prize for Opto-electronics from the Rank Prize Funds of the Royal Society of London for his work on the scanning acoustic microscope. He was awarded the IEEE Medal of Honor in 1988, "For the invention and development of the scanning acoustic microscope." Quate is an enthusiastic outdoorsman. He skis, hikes, jogs, and was an addicted kayak enthusiast until he discovered the sailboard. He is proud of his wife and four daughters.